I know, I know. You already saw me in this jacket on Monday, but I can’t help it. It literally is one of my favorite items in my closet right now. It looks cute with everything and is so comfy! 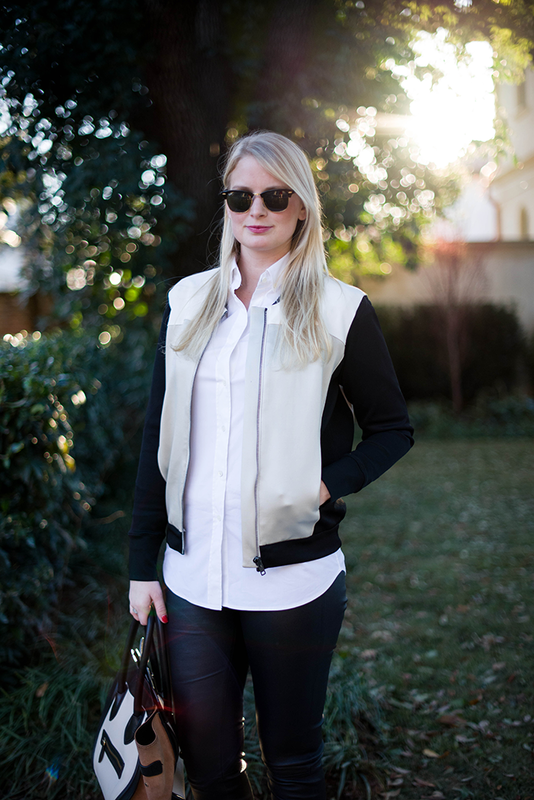 Don’t you think the bomber adds just the right touch of edge to my button-down + leather pants combo? In addition to my coveted Helmut Lang jacket, SCOOP NYC has a ton of other great pieces right now. They’re collection of boots is incredible – I want every pair (specifically these gorgeous calf-hair ankle boots)! You can’t go wrong with a classic pair of pumps either. Click here to check out all things SCOOP NYC – stop by the Dallas store if you’re in the area. It’s the best! Can’t blame you this jacket is awesome, and love this polished look. I agree! very polished look! Love it! No apologies necessary! It is fabulous! have a great weekend! Love the bag, great outfit!!! That jacket is so perfect! Helmut Lang definitely makes me favorite jackets and outerwear pieces. 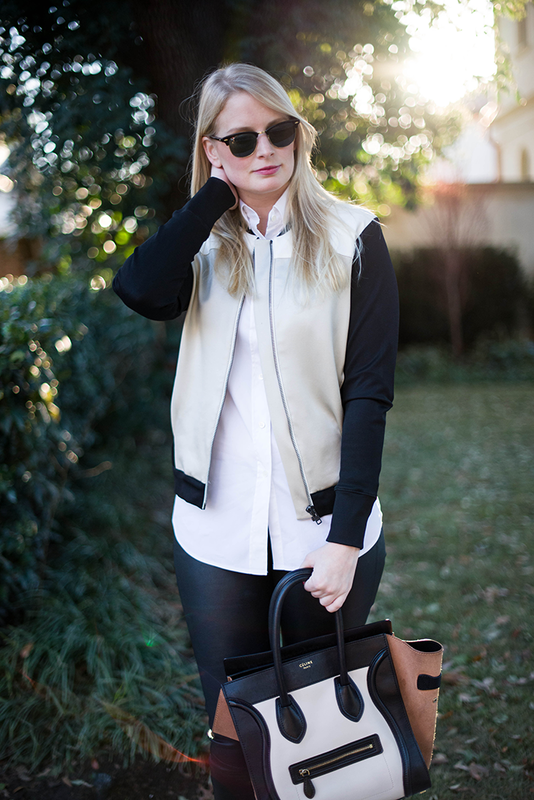 Love this neutral color-block. I also adore the handbag, I’ve been wanting one for the longest time. If you love something, you should wear it multiple times a week! This look is simple, but still interesting. Love it! Classic cool, love that jacket! 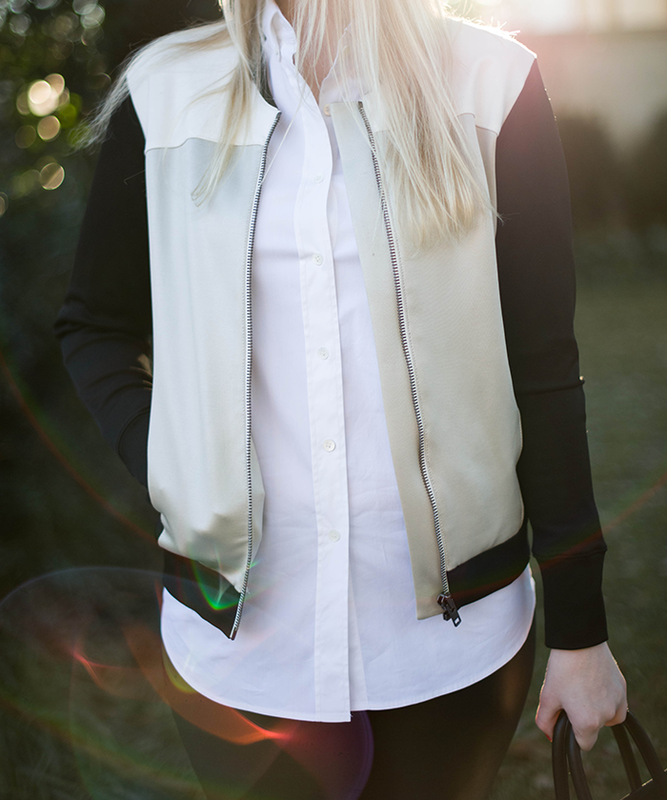 Love how crisp and chic your button-down is! Happy Holidays Merritt! That bag is GORGEOUS. I love it with the green, too. Love this look!! Classic and simple but a little edgy. It is the perfect mix. You look fab!! Have a great weekend! I love the bag actually! You look great the color blocking totally works. I like the bomber paired this way. Love the pants! I love the jacket especially with those rockstar pants.